Gambia Survived Jammeh. Will Transitional Justice Tear It Apart? 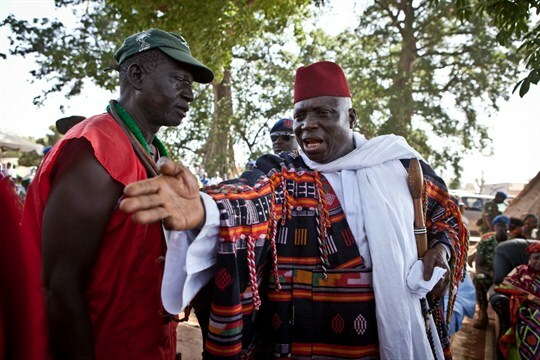 Former Gambian President Yahya Jammeh at a festival in his home village of Kanilai, Gambia, May 13, 2014 (Photo by Jason Florio). In this week’s Trend Lines podcast, WPR’s editor-in-chief, Judah Grunstein, and managing editor, Frederick Deknatel, discuss global climate change diplomacy against the backdrop of the G-20 summit. For the Report, Louise Hunt talks with WPR’s senior editor, Robbie Corey-Boulet, about Gambia’s first tentative steps toward transitional justice for the crimes committed under former dictator Yahya Jammeh, and the potential pitfalls facing that process.